IITYWYKM | What Does IITYWYKM Mean? IITYWYKM means "If I Tell You Will You Kiss Me?". The abbreviation IITYWYKM is typically used as a humorous response to a question. It is generally viewed as flirtatious and would commonly be used in online dating sites. However, it could also be used in a teasing way between friends. Definition: If I Tell You Will You Kiss Me? IITYWYKM means "If I Tell You Will You Kiss Me?". Ralph: Where are the teabags? Ralph: Doesn't matter, I'll have coffee instead. Maya: When do the essays have to be handed in? Maya: I'll kiss you even if you don't tell me. 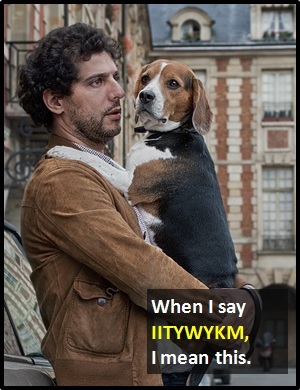 IITYWYKM is an initialism abbreviation. Technically, this means it is pronounced using its individual letters (i.e., Eye Eye Tee Why Dublyu Why Kay Em), but as this is harder to say than "If I Tell You Will You Kiss Me? ", it is not often uttered using its letters. In other words, the abbreviation IITYWYKM is for efficiency in writing and not efficiency in speech. Before the digital era, we would probably have just said "If I Tell You Will You Kiss Me?" instead of using IITYWYKM.